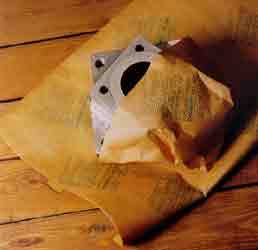 VCI paper protects metals by contact and vapor to keep machined parts corrosion free in shipping and handling. 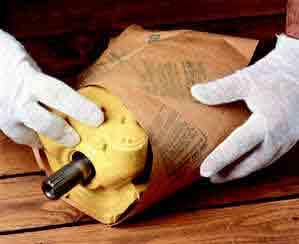 Available in regular vci impregnated kraft paper, wax and poly backed vci paper. VW35D is the industry standard for protecting steel, cast iron and chrome from rust and corrosion. to request more information for this item. A 40 lb./65 gsm neutral natural kraft with Daubert VCI's nitrite-free ferrous volatile corrosion inhibitor formulation and polycoated with 6 lbs./10 gsm of polyethylene. Provides good barrier against moisture and grease together with excellent VCI properties. Excellent water shedding characteristics. Also available in 60 lb. (PC40) for applications where greater tear strength and puncture resistance are required. A 40 lb./65 gsm neutral natural kraft sheet laminated 10 lbs./16 gsm of polyethylene. 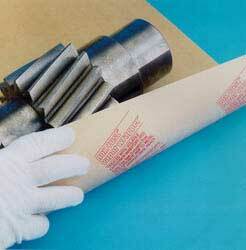 Strong, rigid, laminated substrate resists tearing. Designed for long term storage of ferrous metals where additional strength and moisture barrier is required. Strong and moldable for packaging small parts. Nitrite-free.